A new sensor has been developed for the determination of molybdenum based on the immobilization of pyrogallol red on triacetyl cellulose membrane using absorption spectrophotometric method. The signal of the optical sensor is based on the reaction of Pyrogallol red with hydrogen peroxide as an oxidant in the presence of Mo(VI) to produce a colorless product. Mo(VI) has a strong catalytic effect on the oxidation of Pyrogallol red with hydrogen peroxide at pH 7.0. The difference in the absorbance change of the optode at 545 nm between the uncatalyzed and catalyzed reactions (?A) was directly proportional to the concentration of Mo(VI) in sample solution. 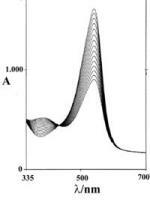 A linear calibration curve (r2 = 0.9885) was observed for the Mo(VI) concentration range of 10 – 900 ng mL–1. The optical sensor was successfully applied to the determination of Mo(VI) in water, wastewater and plant material with satisfactory results.